In June, professional triathlete Eric Lagerstrom was competing for the win at the Escape from Alcatraz Triathlon and found himself in incredible pain and not able to complete the run. Turns out he had a broken foot. Amazingly, two months later he won IRONMAN Steelhead 70.3 and followed that up with a win at IRONMAN Santa Cruz 70.3 in September. What is the mindset and physical regimen required to turn a broken foot into victory; to turn injury into opportunity? Ignore the signs from your body long enough, push through the pain, refuse to miss a workout and sooner or later you won’t be able to deny it any longer; your training and racing will suffer. You’re injured. Every endurance athlete that has experienced injury has surely felt anger and depression set in. You’ve sacrificed and trained so hard and now this? It doesn’t seem fair. You tell yourself you’ll only do part of the workout because skipping it completely is out of the question; after all the pain isn’t that bad. It’s only when you accept that you have an injury that you can begin to move forward and if you follow the advice of Lagerstrom, you can actually become a stronger, better athlete. We caught up with Eric to find out how he went from the devastation of not being able to win his favorite race, Escape from Alcatraz, to storming back two months later to win back to back 70.3 races. 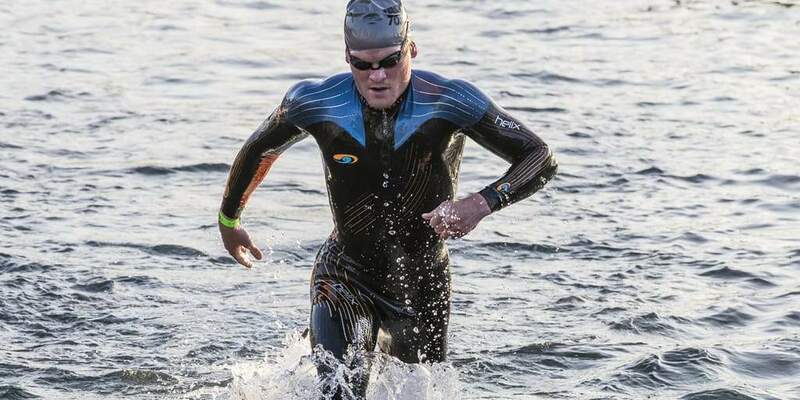 "I think I probably had a stress reaction in the metatarsal after Oceanside 70.3, but I hadn't ever experienced a stress fracture, so I wasn't sure if it was that, or just more phantom nerve pain, which is an issue I've been dealing with for the last few years. I raced Escape Huntington Beach and St. Anthony's on back to back weekends a few weeks later, and I think that really put the nail in the coffin. I was able to run off and on, utilizing a treadmill and and AlterG treadmill before Alcatraz, but I knew the barefoot run on asphalt to T1 was going to be a big stretch.. It's my favorite race of the year, and I was in awesome shape, so I had to go for it though. If it wasn't fully broken before that, it snapped before I got on my bike. The pain was unbearable once my foot was no longer numb from the cold water." Eric experienced a stress fracture in his second metatarsal, and also a stress reaction in the bone directly adjacent to it. The break was all the way through the metatarsal, but he was fortunate that the fragments hadn't shifted, so it was a shorter recovery time than it could have been.